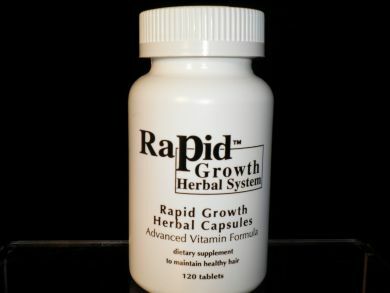 Rapid Growth Hair Vitamins gives your hair that extra boost it needs for accelerated hair growth. Our vitamins contain only natural herbs, essential ingredients to help nurture your scalp and make it fertile for growth. They are geared toward helping the hair grow from an internal standpoint. The vitamins give you amino acids, proteins and minerals all of which ensure effective results in new and healthy hair growth. 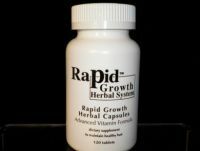 These vitamins have been tried and proven effective particularly with persons who have hair thinning and hair loss. Vitamin B1-Thiamin A protein builder that helps give hair shine, volume and good texture. Enhances circulation to bring nutrients to the scalp. Vitamin B2-Riboflavin Stimulates health and growth of hair, nails, skin and eyes by bringing oxygen to body tissues. Can help eliminate dandruff. May aid in preventing hair loss. Vitamin B3-Niacin amide Supports healthy hair by helping digestion and improving circulation. Vitamin B5-Pantothenic Acid Helps produce full healthy hair by stimulating vitamin utilization and releasing energy from food. With folic acid and PABA can help restore natural hair color. May aid in preventing hair loss. Vitamin B6-Pyridoxine Supports the growth of red blood cells that are important for healthy hair and scalp maintenance. Helps prevent dandruff. May aid in preventing hair loss. Vitamin B12-Cyanocehelamin Required for red blood cell formation to help maintain healthy hair and scalp. Useful in eliminating and preventing dandruff. Blotin Helps improve hair quality. May aid in preventing hair loss, particularly among men. Can help prevent hair from graying. Folic Acid Helps maintain healthy hair and skin. May aid in preventing hair loss. With PABA and panthothenic acid, may delay graying of hair. Inesitol Helps improve skin health, hair shine and body. May aid in preventing hair thinning and loss. PABA ( Para-Aminpbenzoic Acid) Helps improve skin health, hair shine and body. Acts as hair color restorer and an anti-aging agent with folic acid and pantothenic acid. May aid in preventing hair loss. Vitamin C-Ascorbic Acid Supports hair health and growth by improving scalp circulation. Useful in treating dandruff. May aid in preventing hair loss. Vitamin E-Tecepheral Key to hair health and growth by supplying oxygen to the body and improving scalp circulation. Helps combat dandruff. May aid in preventing hair loss. Copper An important anti-aging agent. Necessary for healthy hair. Iron Helps maintain healthy hair, nails and skin tone. May aid in preventing hair loss. Selenium Helps in treatment and prevention of dandruff. Necessary for healthy hair. ZincStimulates hair growth. Aids in preventing hair loss. May help treat and prevent dandruff. L-Methionine May help in preventing hair loss. N-Acetylcysteine Supplies sulfur needed for healthy hair. Essential Fatty Acids- Polyunsaturated Improves texture by preventing dryness, brittleness.